Seat Belt for Forklifts - This guideline reason is to describe the Regulation requirements for the application of operator seatbelts or restraints on lift trucks. It is the employers' liability to make certain that each and every machinery, piece of equipment and tool within the workplace is chosen and used correctly and operated in accordance with the manufacturer's instructions. In regards to their use, design, maintenance, inspection and fabrication Rough Terrain forklifts ought to meet the guidelines of ANSI Standard ASME B56.6-1992. Side boom tractors and mobile machine together with a Rollover Protective Structure, or ROPS for short, should have seat belts which satisfy the requirements of the Society of Automotive Engineers, or SAE, Standard J386 JUN93, Operator Restraint System for Off-Road Work Machines. If whatever mobile machinery has seat belts required by law, the driver and subsequent passengers should ensure they use the belts every time the motor vehicle is in motion or engaged in operation in view of the fact that this could cause the machine to become unbalanced and therefore, unsafe. When a seat belt or other driver restraint is needed on a forklift. 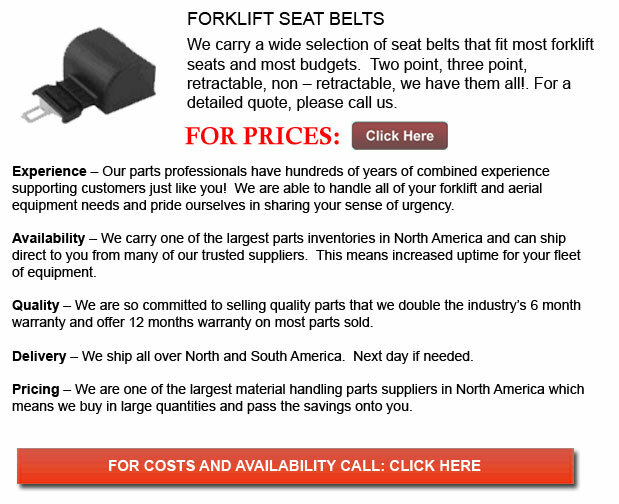 While working a forklift, the seat belt requirements will depend on a number of factors. Contributing factors to this determination may include whether the the forklift is equipped along with a Rollover Protective Structure, the type of lift truck itself and the year the lift truck was made. The manufacturer's directions and the requirements of the applicable standard are referenced in the Regulation. With regards to powered industrial lift trucks, ANSI Standard ASME B56.1-1993 refers to an operator restraint device, enclosure or system. A driver restraint device, system, or enclosure is designed in order to aid the driver in lessening the danger of entrapment of the head and/or torso between the truck and the ground in the event of a tip over. The restraint device or system could comprise a seat belt, although a seat belt is not essentially a part of such machine or system.